Unless you never look at your bank account, you’ve probably noticed that having a dog can get expensive. Vet bills, toys, food and more all eat up a healthy chunk of change. Curious about the costs of feeding your dog a raw food diet? Feeding your dog a raw diet costs considerably more than a regular kibble diet — but the benefits are worth it in my opinion. How much does a raw food diet cost? Read on! 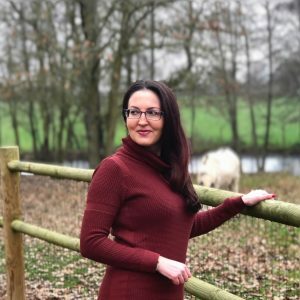 You might have heard the buzz around raw diets lately (I’ve written about why we made the switch HERE) and if you’re curious about the cost, I’m here to share my experience. Keep in mind that every dog has different needs and what works for us might not work for you. Simply put, a raw diet for dogs is expensive. This goes double if you buy commercial raw diets like Stella & Chewy’s, if your dog is big or you have several dogs. While I personally feel the benefits of feeding raw outweigh other feeding options, a dollar is still a dollar — and it adds up. It’s also a commitment and you can’t switch between kibble and raw without seriously upsetting your dog’s digestive system. So here’s how much it costs me along with the top ways to lower the cost of your dog’s raw diet. 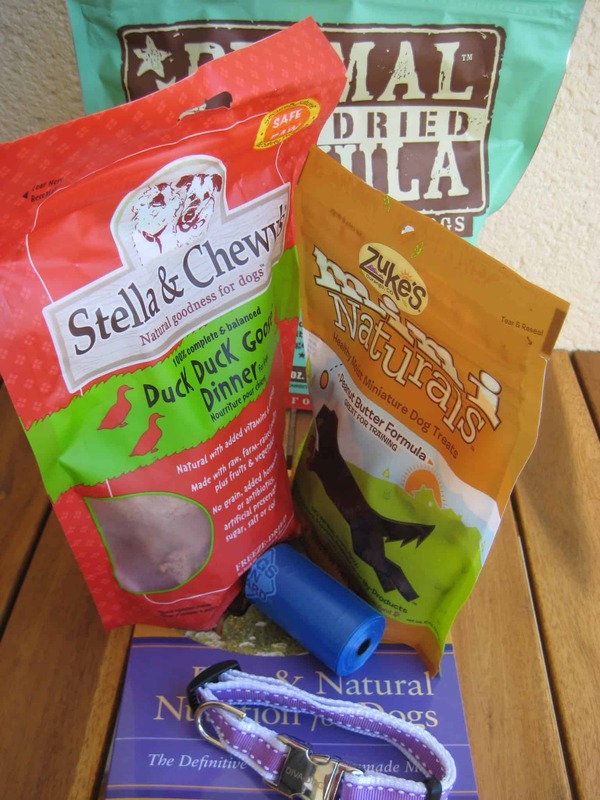 Dagny eats Stella & Chewy’s freeze dried raw food exclusively. Why does she get pre-made? Well first, I find that a pre-made diet is easier. It takes the guesswork out of preparing your dog’s food and ensures the proper nutritional balance. 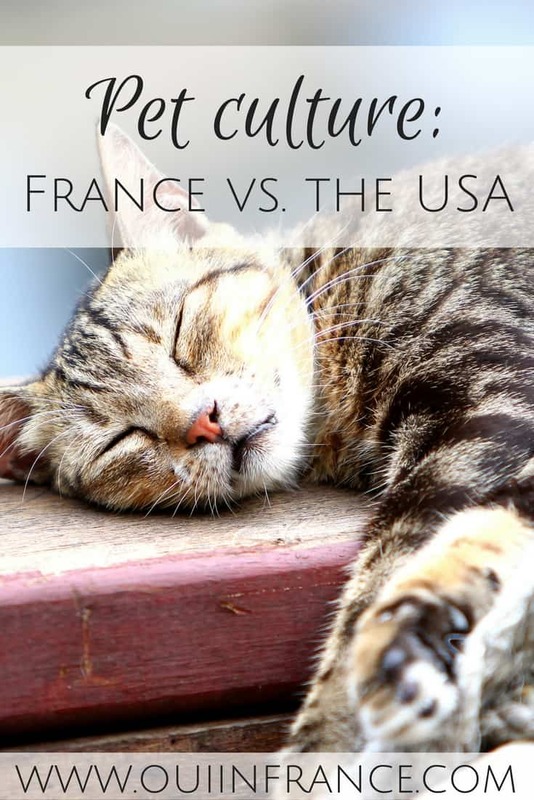 Also, when it comes to different brands, no pre-made raw diets are available in France and I can get the best deal on Stella & Chewy’s online (read on for more on that). A raw diet isn’t just about giving your dog random pieces of raw food and fruits and vegetables. Calcium is an extremely important component along with other nutrients that can be easily overlooked if you don’t know what you’re doing and don’t maintain the proper balance. Why else do I feed pre-made raw? It’s also the quickest option. Just add water to the patties, mash it up and you’re done. Stella & Chewy’s is one of the few brands that makes a complete freeze-dried option. Before I decided to go the pre-made route, we did alternate with raw food diets that I’d prepare myself. How much does a raw diet for dogs cost? Let me break down what Dagny eats and the approximate costs based on her size and nutritional needs. Protein sources: Depending on what types of meat I’d buy, this would run anywhere from 8 to 20 euros a week. She eats a rotation of beef, salmon and other fish, turkey, duck and rabbit (when I can find it on sale) and about 10-20 percent of her diet is organ meat. If you buy in bulk and feed your dog the cheapest protein, you can keep the costs down. Our butcher would also give us veal bones for free. Fruits/vegetables: She’ll eat a mix of broccoli, cauliflower, spinach and whatever else is on sale and this is about 5 euros/week. She’ll get yogurt and eggs a couple of times a week as well. Supplements: Dagny’s vet provided us with a vitamin supplement to make sure she was getting everything she needed. It’s 15 euros for a big drum of powder that lasts about 4 months. I also have an omega 3-supplement that’s about the same price and lasts several months as well. I would make a batch for the week ahead and freeze the patties in individual portions. Our freezer is tiny, so I only did a week at a time, but it helps to cut costs if you buy in bulk and make a lot upfront to freeze for later. To further cut costs, buy seasonal vegetables and meats that are on sale. This seems like a no brainer, but it’s key to keeping your spending in check. I’ll use a 16 oz bag of Stella & Chewy’s Freeze Dried Formula for my calculations. At Dagny’s age/weight and with her nutritional needs, a large bag of this size lasts us about 10 days. Each bag is about $25 after discounts, so it costs us about $75/month in food (before adding in the cost of shipping it to myself since nothing like this exists in France). Stella & Chewy’s is comparable in price to its competitors. 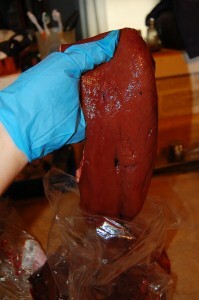 There are also frozen raw food patties available that are similar in cost. Whether or not you feed freeze dried exclusively, sometimes you just don’t have the time or energy to whip up a fresh raw meal for your dog or you’ll be traveling, so having some freeze dried meals on-hand can be a lifesaver. Make friends with your butcher. Oftentimes, meat and bones that are discarded at your local butcher can be put to good use. These scraps make several meals for your pet — for free. Our butcher loves giving Dagny raw bones that are longer than she is. You won’t know until you ask. I find that people are interested in hearing about what she eats and why. It’s especially fun trying to explain this to country folks in French who don’t know anything but regular ol’ kibble. They think it’s an American thing. Use promo codes wherever you can for raw diet foods you buy online. My go-to raw diet for dogs supplier is doggiefood.com. They’re my favorite online pet store and one that actually lets you use discount codes on food too! They have a great selection of raw diet meals for dogs and cats as well as treats. They offer free shipping and have prices that cannot be beat. Keep an eye on social media. Following your favorite brands on Twitter and Facebook can help you to be in-the-know when it comes to savings. Buy in bulk for savings. 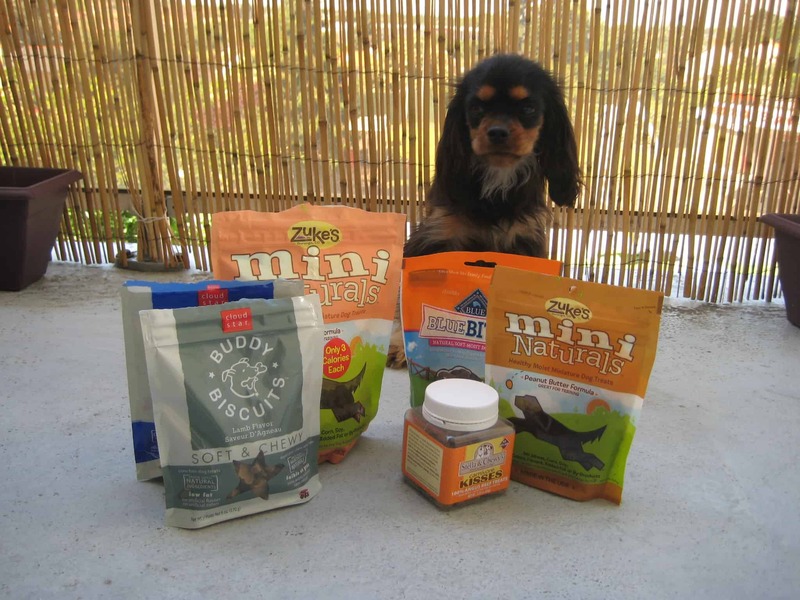 Buying your dog’s raw food in large quantities can sometimes help you score a deal. If you have a big freezer (or pantry for freeze dried), scour the web for deals and then stock up. What you do NOT want to do when you’re short on funds is to skimp on your dog’s nutrition or health. Do not feed a smaller portion of lesser quality or old meats to save a few bucks. Your dog will not be happy and you probably won’t be either if you have to make an emergency trip to the vet. Your dog will be the one who pays. A raw diet must-have: A colorful snood! 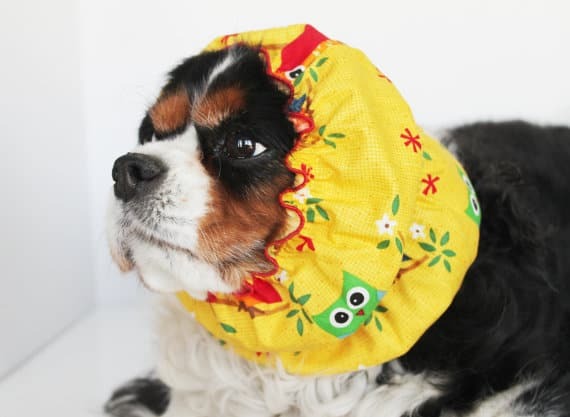 A cute snood is a raw diet must-have. This fabric head covering holds your dog’s ears back so they don’t get in the food. Check out Terri of Daydogdesigns for a great selection! Tom thinks Dagny looks ridiculous in her snood, but they certainly serve a purpose! Also, let me wrap this up by saying that a raw diet isn’t just a passing fad, nor does it work for every dog. Be sure to consult with a veterinary professional before changing your dog’s food. If not done correctly, a raw diet could make your dog sick. Curious about why anyone would feed their dog an expensive raw diet? Well, different dogs have different needs. For us, this is what works. Aside from stopping her diarrhea from kibble in its tracks in just a day, the positive effects are hard to miss. 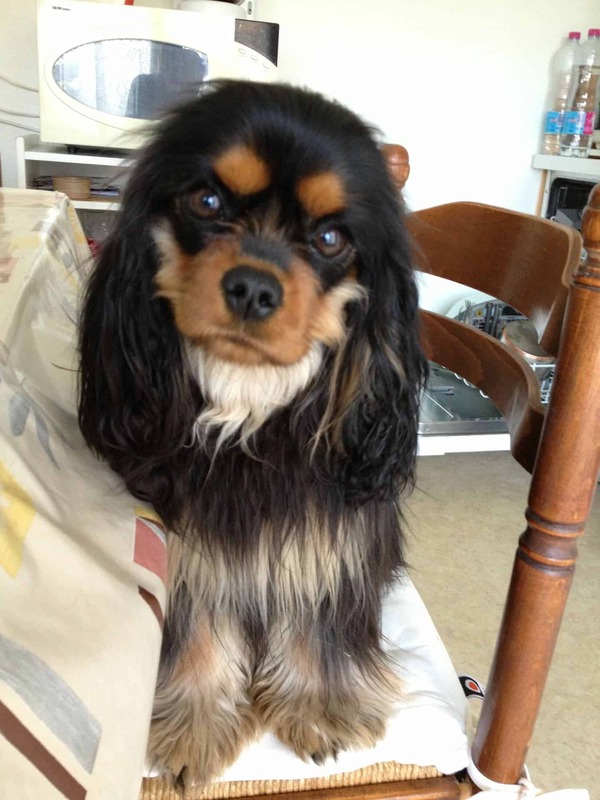 Dagny has a shinier coat, more energy, LOVES mealtime and just seems healthier and happier overall. And who wouldn’t want a happy dog? Disclosure: I was not compensated in any way for writing about Stella & Chewy’s. I personally love the brand. All opinions are my own. « Interview: What is house sitting all about? I’m truly considering making the switch over and will be sending of a query to a holistic vet today about our dogs’ dietary issues and cost. I’m pretty excited. Thanks! I think “Buy with the money saved” must preserve good food. Otherwise it will be counterproductive.